Otto Müller is another German Expressionist that was part of the group “The Bridge” (die Brücke). The painter started his artistic path using the elements from Impressionism and Symbolism, but later after joining the group of Expressionist, shifted his style. 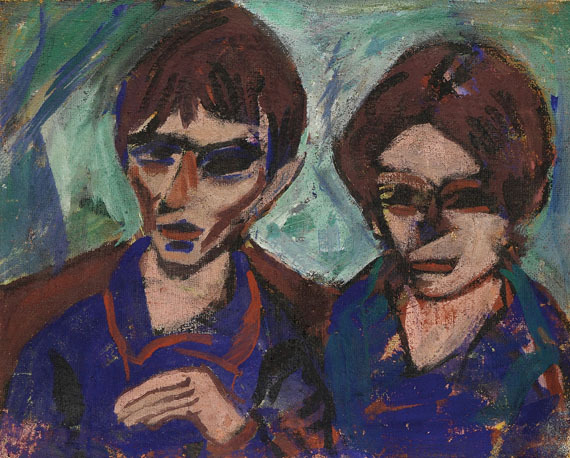 As it was previously written in this blog, there were two main Expressionism groups in Germany in the beginning of the 20th century. Having a closer look at the works of both groups I made my own conclusions that “Die Brücke” group tend to create sharper and more vivid works then “Der Blau Reiter” (Blue Rider). Die Brücke was founded in Dresden and that was my first time to view the works of these Expressionists, and Müller in particular. What I can say about my impression is that despite of the “darkness” of these paintings, I felt that the people from the painting were looking deep in my eyes. One can read the happiness, grief or lust in these people’s eyes. It is needless to say that it is totally worth to view Otto Müller’s works live and grasp the energy of his works.